In light of the Legal Code (Vinaya) of Buddhist Law or Dharmic Law, the spiritual master analyzes that only the laws of righteous and appropriate word can regulate human being's Freedom of Expression, because freedom of thought and speech are the very basis of full freedom of action that every Free and Enlightened Being (Arhat-Bodhisattva) manifests. This means that while the individual's expression is guided by righteousness and never by violence and lying against other beings, the State has the duty not to hamper and doing-nothing (wu-wei) faced with these free expressions. In the field of Maitriyana, Freedom of Expression is the main force against greed, hatred and delusion that are encouraged by governments and corporations around the world, by denouncing the illusions and falsehoods that threaten Peace and Truth. Following Gautama, the spiritual master notes that the criteria to consider in determining the possible restriction on expression must be those which have been developed in the Buddhist Law with regard to violence and lie, manifesting confidence in the prudence of the Ethics Committees and Tribal Courts of the Spiritual Commune (Sangha). Therefore, the Maitriyana considers as correct the statements, conventions and covenants on human rights and civil rights, in the sense of establishing that the legislative and administrative powers of State cannot restrict Freedom of Expression while wishing to maintain a democratic political Order. In this regard, Freedom of Expression must be regulated by the spiritual values of Justice, Ethics and Righteousness. The Free and Enlightened Being (Arhat-Bodhisattva) clarifies that freedom of expression and thought constitute the same spiritual nature of humanity, and one of the main virtues of conscious life. Thus, the tradition of Buddhist Law does not ignore that the fundamental structure of human existence is Liberty, while accepting the righteous word and appropriate behavior as disciplinary guidelines of that liberty, because without this sublimating application the apprentice would fall in the field of debauchery and perversion. When an individual opens his eyes to Peak Knowledge (Satori) then the Awakening (Bodhi) of Truth happens as a new correct way of looking at life. Thus, the legal corpus of Maitriyana recognizes the fundamental difference between Liberty and libertinage, considering that the contents of Freedom of Expression and Thought must be regulated by the values of Truth and Ethics, which explicitly means that the State must not impose standards for their regulation or legal restriction, because they could be considered libelous, subversive and illegal behaviors to all criticism toward the Power of the status quo and even also to the very perception of the Real. Indeed, Truth and Ethics comprise the Path of Righteousness of Spirituality, so that the Buddhist Law is that which has the Purpose (Dharma) to point out how the contemplative practice regulates two types of restrictions on Freedom of Expression: violence and lies. While the apprentice expresses himself being faithful to the Truth, which means always speak with evidences and never with prejudices, at the same time he is faithful to Righteousness, which means always behave peacefully and never do harm to other beings, then his conduct will be legal from the Maitriyana's perspective. However, the Buddhist Law - in the same way as human rights - can be considered a subversive and defamatory activity from the point of view of a State devoid of democracy and legal pluralism, even though clearly the Dharmic Law that Maitriyana practices lacks both malicious intent and a clear and present danger to others. In this way, the practice and doctrine of Buddhist Law is a matter of ethical and spiritual principles and not a matter established by the government. In this sense, the core of ethics committees and tribunals of consciousness defended by the Maitriyana aims to reveal and teach the Truth rather than simply make moral, criminal and monetary penalties, reason why it is a Counterpower remarkably different from administrative and legislative powers of the state system that attempt to control or suppress the fundamental freedoms of thought and expression. One of the characteristic features of the Buddhist Law is that it does not shy away from what should be the main inquiry of the State that is to ask itself what is the Purpose (Dharma) of society. In this regard, the Maitriyana response is coherent and largely explains where humanity is headed, because it goes back to the very foundations of life, stating that the Purpose (Dharma) of the human being is Liberation. In fact, this is the Cure (Nirvana) of the ills that repress the Adequate Freedom of Thought and Expression, by preserving the freedoms intrinsic of human nature. Thus, the Buddhist Law complies with what should be the goal and desire of all government: the defense of human rights of all people. A governmental regime that ignores these rights and freedoms intrinsic does nothing but ruling by the sword, oppressing and shedding innocent blood to maintain its authoritarian Power. Faced with global history characterized by repression of Freedom of Expression and Thought, the Maitriyana teaches the way to a new stage of freedom of mind and speech. Therefore, the spiritual masters follow a Legal Code (Vinaya) that does not attempt to imitate the worst legal systems of the past, but rather initiates a utopian historical experience. Buddhist Law is about a radical metapolitical vision trying to mold a new concept of civilization into a Pure Earth. This spiritual and meta-intellectual tradition is not only based on Free and Enlightened Beings (Arhats-Bodhisattvas) such as Gautama and Jesus, because it is also consistent with philosophical developments of Hobbes, Locke and Hume. Therefore, the basic concept of Liberty that emerges from the Maitriyana tradition refers to the Full Freedom of Thought, Expression and Action, except when it involves the use of violence and lies against other beings. This vision of Liberty alludes to the individual's ethics and does not contain regulatory element by the State, which only has to sanction aggression and deceit. 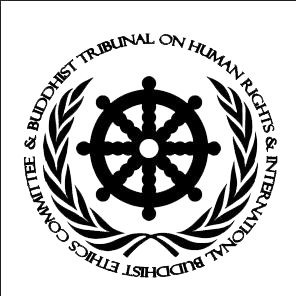 Thus, there is a relationship between the Buddhist Law and Customary Law on grievances. In the Maitriyana it is proposed a consideration of Freedom of Expression as an essential part of human social nature and its ethical values, rather than considering it as a practice regulated by artificially created laws. Freedom of Expression is a fundamental human right by being indispensable for the development of both psychism and society, since it affects the verbal, artistic, scientific, journalistic, juridical, political, educational and philosophical expressions, among others. Thus, the State has the duty to guarantee the apprentice's Freedom of Expression in all spheres of life, both facing governmental institutions and in relation to private institutions. The individual must exercise this right to have his or her own opinions, to research information, to enjoy university autonomy, to seek the Truth and to freely disseminate ideas. Therefore, the main human rights are impossible to comply without guaranteeing the right to Freedom of Expression. The recognition of these social freedoms is guaranteed by the Buddhist Law, which is an ancient system originated in the convictions and customs of the spiritual Commune (Sangha). Freedom of Expression emanates from the inside of buddhic nation, since it is the result of its libertarian meditation and cultural identity. Hence, the law that sets out the rights and duties of Freedom of Expression emerges from Maitriyana, which means that the spiritual master teaches the pathways and limits for the appropriate expression of Liberation.